"What a special person Pat was! The whole Austin family has been part of all our lives if we grew up in Brevard. My mother-in-law, Janie Chapman, went all the way through school here with St Clair Bill Austin. Pat made my engagement announcement photo that was in the Transylvania Times. The families collection of photos has been an absolute treasure to our county. We appreciate the Austin family and will miss Bill and Pat and Jeanette. Blessings to the Austin family." 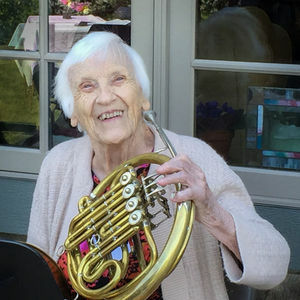 "Pat's beautiful smile, her gracious ways and her love of music, birds, cats and astronomy will remain with us. Brevard's history always seemed alive when Pat related stories about her childhood days. A dear lady." "I worked at Austin Studio in 1968-69 with Jeanette, Bill and Pat. Jeanette was the business end of the operation, Bill was the frame maker and Pat was the calming effect for the whole place. Sweet people , enjoyed them all, but Pat was a very sweet and special lady."